An exciting and spiritual excursion to one of Europe's most visited sanctuaries, which, since 1981, the year of the apparition of Our Lady to a group of children, has been a destination for pilgrims from all over the world. We will set off by coach from the port of Split for Medjugorje. The small town in the municipality of Citluk, in Bosnia-Herzegovina, it is located at the foot of two hills, the Krizevac and the Podbrdo; its name, meaning "in the mountains", is derived from its geographical location. The town of Medjugorje acquired worldwide fame on 24 June 1981, when a group of local children aged between 10 and 16 claimed they had seen regular apparitions of the Virgin Mary, who appeared to them as the Queen of Peace (Kraljica Mira). From then on, Medjugorje became a popular pilgrimage destination for the faithful from all corners of the globe. 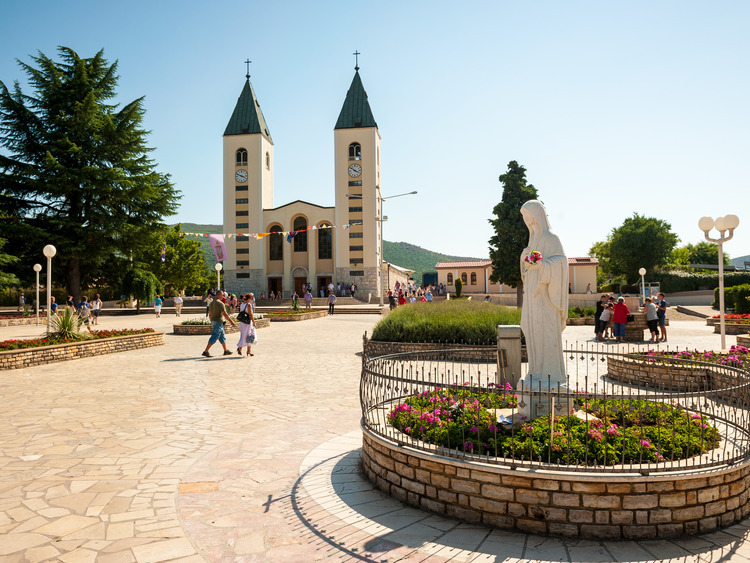 Once we arrive in Medjugorje we are free to visit the Podbrdo, or Apparition Hill, and take part in the Mass. You must bring a valid passport or, for European citizens, a valid identity card. Comfortable shoes and dress code that is appropriate for the places of worship to be visited is recommended. The path up Apparition Hill is steep and winding. The coach transfer from Split to Medjugorje lasts approximately 2 and a half hours, plus the time required for crossing the customs checkpoint between Croatia and Bosnia. The guide who accompanies the guests will not be able to provide commentary once in Bosnia. This tour includes a basket lunch selected by our ship staff.